I'm super excited to have my work featured in the latest book from Heavy Music Artwork: Aesthetics of Sickness. The book will feature not only imagery from yours truly, but also lots of amazing creepy art from lots of amazing artists in addition to interviews with some amazing bands including Cannibal Corpse, Carcass, Napalm Death, and more! I'm pleased to be able to offer my followers a 15% discount off the book with discount code IWANTGORE15 (the discount is available only for presell). During a recent trip to Europe I had the great pleasure of visiting and photographing the catacombs, Paris' infamous underground ossuary. You can have a look at my favourite images from the trip in the slideshow above; there are many more in my new gallery Empire of Death. If you're unfamiliar with the catacombs, then perhaps a little history is in order: The catacombs began as a network of old caves, quarries, and tunnels that stretch for hundreds of miles far beneath the bustling streets of Paris. In 1786 they were blessed and consecrated by the church, and used to house corpses from the overpopulated and overflowing Parisian cemetery Les Innocents, many of which had been improperly buried in open graves leading to concerns over the strong odour of rotting flesh and the spread of disease. In 1810 the catacombs were renovated to the form they take today: monumental tablets and archways were added, and the skulls and femurs of the dead where stacked along the walls into various decorative patterns. This new project is a departure from my previous work along several directions. Firstly the obvious: this is my first time featuring work on my website that isn't about the ethics of eating animals. This is perhaps an overdue addition. It had never been my intention to make the page entirely devoted to meat photography and, indeed, I have a couple more non-meat projects in the pipeline, but these are logistically complicated and are taking somewhat longer to complete than I had expected. Initially I had planned on making my new gallery Empire of Death rather more succinct than it ended up. My plan was to display only 10-15 of my favourite shots from the trip; generally I tend to prefer a "less is more" approach to displaying my work, trying to emphasize only the best shots and avoid too much repetition. But the more I worked on the images, the more I came to realize that this gallery is conceptually distinct from my studio work and calls for a different approach. The repetition of similar imagery in this gallery serves to convey the enormous scale of the catacombs, something I had not really been prepared for when I visited. But, more to the point, it was only during the editing process that I came to really see these shots for what they really are: portraiture of the dead. Every femur and every skull is different; one would no more argue that the repetition of these images is monotonous than one would argue that a series of head-shots of different models becomes monotonous. From a technical perspective this gallery is also a bit of a departure for me. This is my first time featuring work on my website that is shot in available light, as opposed my studio work where I always to have complete control over the lighting. Photographing the catacombs of Paris is a technical challenge for several reasons, but the most salient point here is the fact that the catacombs are a very low light environment. I found myself shooting almost exclusively with the aperture wide open. This is a technical choice that I almost never make in my studio work; for aesthetic reasons I tend not to love the shallow depth of field effect that so many other photographers are enamoured with. Initially I had mixed feelings about this choice; however, while editing these shots I came to find that the softness of the backgrounds/foregrounds adds a sense of mystery to the images that grew on me. In future blog posts I intend to discuss this project in a bit more detail. In particular, I'm planning to write in more depth about the technical aspects of shooting in the catacombs and also I'd like to write a short post about my thoughts on colour vs monochrome for imagery like this. In the meantime, please enjoy the new gallery! I've added some new macro images to my Inside gallery. For this last session I focused on two subjects: pig intestines and chicken feet. The former I've tried to use for close-up work several times in the past but without much success; I just ended up with a lot of nondescript pale wrinkly looking stuff. It turns out that the solution is to move further down the digestive tract: the large intestine makes for a more visually interesting subject than does the small intestine. Enjoy! Over the last couple of weeks I've been exploring framed dead animal parts. Of course regular fine art prints of all these images are available, but I'm also doing one-of-a-kind prints where each photo is framed in the same frame that appears in the photo. Those unique pieces are signed, sealed, ready to hang, and the frames have been thoroughly cleaned of all traces of animal gore. As always you can contact me about prints here , but I'll also have a table set up at the Hamilton Ontario Art Crawl (on James St N) on Friday November 11. Enjoy! My artistic output has been a bit scarce over the last month or so as my spouse and I have been adjusting to life with our newborn daughter. We've finally started to get some semblance of a routine established and last week I managed to find an afternoon to get into the studio and work on some new macro photography. I've put off shooting seafood for a long time now, mostly because slimy things are extremely tricky to light. For this first experiment I limited myself to two subjects: an octopus and a soft-shelled blue crab. I've added my favourite images from the session to my Inside gallery. Enjoy! I've added some new close-up shots to my gallery Inside. The first image, previewed above, is a close-up view of the thumb of a black chicken. (Black chickens -- also called Silkie -- are totally a thing that exists, it turns out.) When I first noticed this weird double toenail I assumed it was a malformation of some kind; I've spent enough time looking a chicken feet up close to know that sores, defects, and other disease markers are pretty common on the meat we purchase. However, after a quick search on google it turns out that Silkie chicken feet just naturally look like that. This beast is quickly becoming my favourite kind of chicken. The remaining shots are all close-up views of various parts of a lamb's head. In order: the teeth, the nose cavity (sawed open to reveal the bone structure), the base of the skull, and the ear cavity (ear removed). I had a lovely time in Minneapolis, seeing the sights, catching up with old friends, and taking death-themed photographs. My last evening in the Twin Cities was spent shooting among the ruins on the Mississippi at twilight. I had come to that location with the intention of shooting the water and mill ruins; however, my companion spotted this dead rabbit. My favourite subject matter, what luck! If you zoom in you can just make out the maggots squirming around in the vacant eye socket. I only regret that I didn't have my tripod and macro gear to do the scene justice. I'm super excited to be heading off to Minneapolis in a few days, where I will be catching up with some old friends, may of whom I haven't seen in person since in the days when I lived in a filthy run-down bachelor flat in Dinkytown. The building was a mess and there were fraternities everywhere in that neighbourhood. It turns out that American undergraduate college life is exactly as portrayed in Hollywood movies. When the weather was nice bros would hang out on lawns, toss footballs at each other, and drink beer through a funnel while their girlfriends cheered them on and drank sugary pink stuff. The whole thing was surreal. (Dear friends in the US: you really should know how singular this kind of college experience is; getting a higher education is nothing like that elsewhere in the world.) I'll probably post some shots from around the city when I get back. In the meantime, please do enjoy this latest batch of macro photography. In order, we have: the eye of a lamb, the lamb's brain (which made the most delightful "schlup" sound as I extracted it from the skull with my thumb), the eye of a black chicken (these are a thing that exists, it turns out), and two extremely close-up views of a pig ear. Crucifix with chicken feet and pig casings. At about age 37, emaciated and racked with coughing and pain, she took to her bed until she died four years later. Her painful gums were so badly infected that her teeth fell out, one by one. Her body was covered with putrefying bed sores, but when the sisters offered to move her she warned them off for fear that by touching her body they might experience sexual desires... A large statue of her holding a flagellant whip can be seen in her church in Florence, where people around the world still come to pay her tribute. 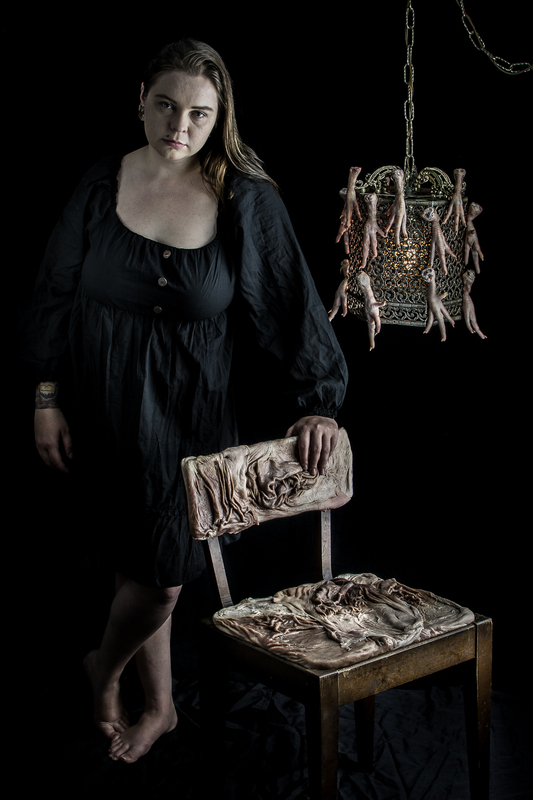 Book bound in sheep stomach with dead flowers and sheep stomach lampshade. Dead flower with chicken feet and cow tongue. I've added 3 new macro shots to my gallery Inside, all close-up views of various parts of a cow foot. The image above and the one below are different views of the dew claw on the back of the foot. The last image is a view of the front of the hoof, which was split and broken open, revealing a bunch of interesting texture. When you purchase chicken feet from the butcher it's not uncommon to find sores and abscesses. (This is not particularly surprising if you know anything about how chickens are farmed.) Normally I avoid using those feet in any of my photography, or else I remove the blemishes in photoshop. For these shots (recently added to my gallery Inside) I decided to go the opposite route: getting up close and intimate to present a macro view of the sores on a couple of feet from a recent purchase. Enjoy! Still life arrangement with chicken feet, cow foot, pig intestine, duck gizzards, and dead flowers. I've added a couple of new still life arrangements to my Still gallery. The arrangement above, which mixes animal parts with dead flowers from my backyward, was loosely styled after the still life compositions of Cezanne and, in particular, Goya whose work with meat has always fascinated me. Enjoy! Still life: candle holder with chicken feet. I spent my Sunday evening building a sheep stomach book cover and pouring over the bible by candle light. If you zoom in over the open bible you can read one of my favourite passages.